I am a farmer, but I am not your parent’s farmer or your grandparent’s farmer. I am part of a new breed of farmers quietly popping up all over the world. Some discount us as just hipsters playing around, but for those that are serious it’s farming and it’s a lifestyle. We are the urban farmer. We find any small plot of land, backyard, or abandoned lot and turn it into an edible forest. We quietly are waging a war against the suburban ideal. We protest the food system we grew up in. We want off of the industrial food complex. We like our loud music. We farm to feed ourselves and our friends. Quietly we are popping up, we could be your neighbor, we could be your son or daughter. We search out the land time forgot and turn it into something beautiful. Most of us do this while at the same time sitting at a desk all day, we might be your co-worker secretly toiling away in our after hours. Either way we are here and we are growing in numbers. As I visit the various parts of the country I see tiny glimpses of the future of farming in each suburban neighborhood. Garden and gardening is not a new idea, people have had backyard plots for years. Only recently have we seen the boost of more and more people moving out of the shadows of backyard and into the front yard with their gardens. People are embracing the ethos of Food Not Lawns, and using the scarce resources of water we have for food and not landscaping. Being an urban farmer is being a revolutionist. But instead of fighting with guns, words or marching the streets we pick up a pitch fork, start a compost pile, and go searching for the best soil in town. Our hands get dirty with the soil of the earth, instead of taking from the people we want to give back. It is a different type of revolutionist, we are not our parents but carry some of the zeal they brought out in the 70’s. We the dot com generation know that if we want change we need to make it at the hyper local level. We are the ones that need to opt out and find new ways off the hamster wheel. So we garden, we try to gain back the knowledge our grandparents inherently knew. We are learning to forage and feed our plants with something other than chemicals. You might see us picking some plant off the side of the road, we aren’t homeless but instead of weeds see food all around us. The most subversive act today is hyperlocal farming and we are at the heart of it. The revolution is here and it’s already intrenched in society. For years I have been interested in bees. Much of that time was being interested in ways not to get stung by them or how to get them away from me, but over time my attitude towards them as changed. Years ago while still in Vermont one of my friends got two hives one spring. we coached lacrosse together at the local school so she would share stories of the bees and the process. I think this was my first real excitement about the idea of actually keeping bees. Fast forward a couple years later, this fall my mother asked me what I wanted for Christmas and I blurted out, “a beehive”. A few weeks later a beginner kit from Mann Lake (ordered through Amazon Prime) arrived at my doorstep and I was quickly assembling it in our tiny house. 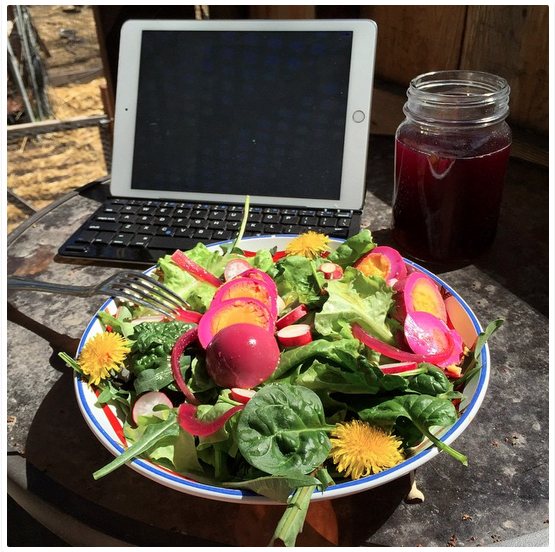 This kit along with a book – The Beekeeper’s Bible, started the whole journey. The book at first did not draw me in, but now it’s one of my favorites learning the history and comprehensive knowledge on the subject. Had I known what I know now I would have probably started with a different kit and order it directly from the website. Beekeeping books, not including the ones on my iPad. Quickly, I did what anyone of my generation does when wanting to acquire a new skill, I went to the internet. I found local beekeeping groups on Facebook, honestly sometimes those conversations scare more than encourage one to get going, but the information is extremely useful. Though some YouTube videos, online articles, and participating in groups, I found myself ordering one package of bees. About two weeks later I would also order a Nuc after learning more. For now I am in what I call the academic stage of beekeeping. My book shelf is full of beekeeping books, I spend my free time watching YouTube videos, I am tinkering with ways to modify our langstroth hive as well as Forest building me a Top Bar Hive. It is safe to say I have spent much of the last couple of months reading, whether it be while traveling or in between appointments, in the mornings or at night before bed. My reading list has been consumed with all things bees and beekeeping. There are tons of great books out there. Some that I personally liked others might not, but for me and my goals here are some of the best books and the ones I wish I had left at Amazon. As you can see below I have been busy. Top Bar Hive Almost finished. Almost in it’s resting place. I spend my days online for work, researching, reading and writing. So when it comes to my hobbies I immediately turn to what I know and that is researching online. I can honestly say the best resource online is from Michael Bush aka The Practical Beekeeper. His website, BushFarms.com, is the best online resource I have found. He also put all that information into a series of books. Sometimes it’s just easy to google what I want to know. Biobees.com, run by Phil Chandler aka The Barefoot Beekeeper, has also been a great resource. His natural beekeeping forum has the answer to almost any question. YouTube has everything, the good, the bad and the ugly. Sometimes I watch it more to watch what not to do. But overall there is a ton of information on it for the visual learner. My favorite people to listen to are Michael Bush, Les Crowder, and Sam Comfort all of which have tons of information, although Crowder does not have many videos. YouTube is like jumping down the rabbit hole, you have to decide how deep you want to go. Netflix has been a great resource for watching documentaries about bees and beekeeping. Even if you are not interested in keeping bees you should watch these documentaries. Maybe you will want to keep them for yourself. Those are just some of the resources I have been jumping into the last couple of months. Our bees come in April and in the next post I will cover what our plans are for our hives, how we plan to manage them. Why we choose two different types of hives to start with and two different starting methods, and finally we admit to ourselves we are a bit crazy. Beeland under construction. From composting area to bee habitat. Disclosure: This post contains affiliate links, which means we receive compensation if you make a purchase using the links above. We use this to help continue to grow our wannabe urban farm. We have had a weird winter to say the least. Finally the night temperatures are below freezing. As we panic about the plants which came up prematurely one part of our backyard doesn’t seem to notice much, our chickens. They continue about their day as long as it’s sunny. 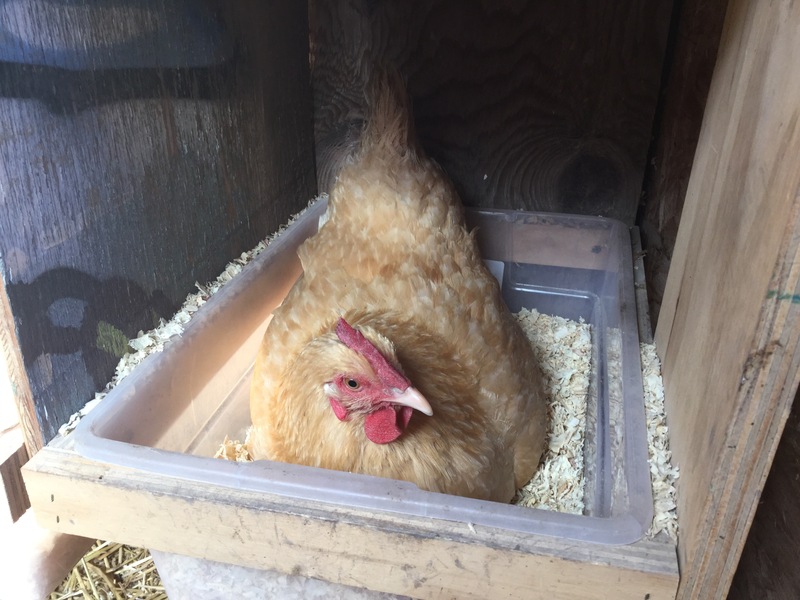 If you would have told me a couple years ago that chickens would be one of the easiest pets I could have I would have laughed. But they are, I promise. 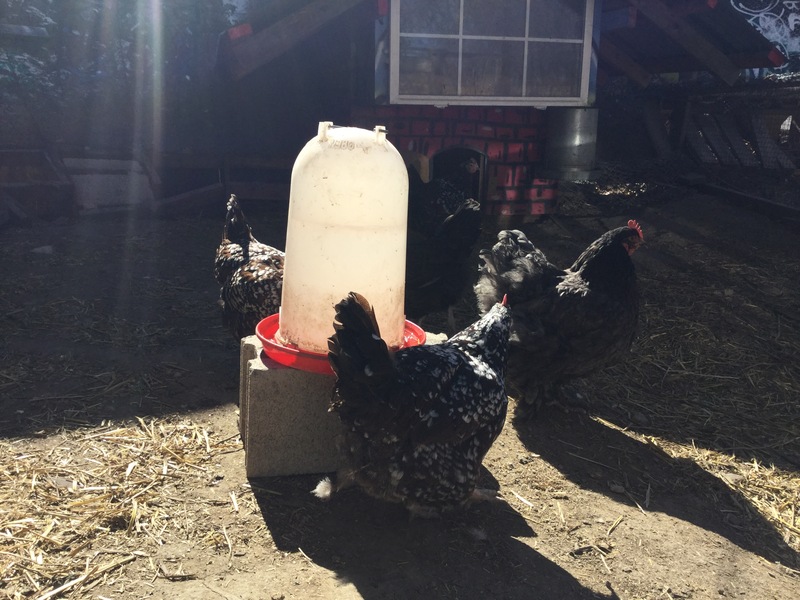 Chickens are great on so many levels, we love them but know once egg laying is over they will end up in a crock pot. The cycle of life on a wannabe urban farm. I like to refer to those days as “chicken processing” sounds so much nicer than “killing” or “chopping their heads off” or other explanations. But that is part of the process and for another day. Right now the water was moved into a sunny location to melt off the thin layer of ice, they are bathing in the dirt, rolling around and being overall just happy. Water in the sun on a cold day. 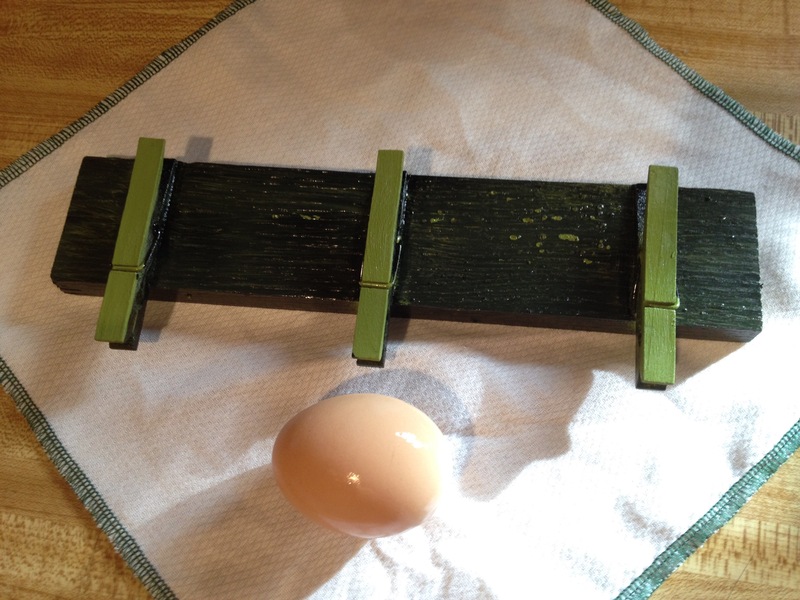 I think if your chickens are happy then your eggs are too. The ones you collect to eat have a special mojo to them. We get out of them what we give them, so if we give them a happy environment, great food, and a stress free life then I think we get a little extra in those eggs we eat for breakfast. 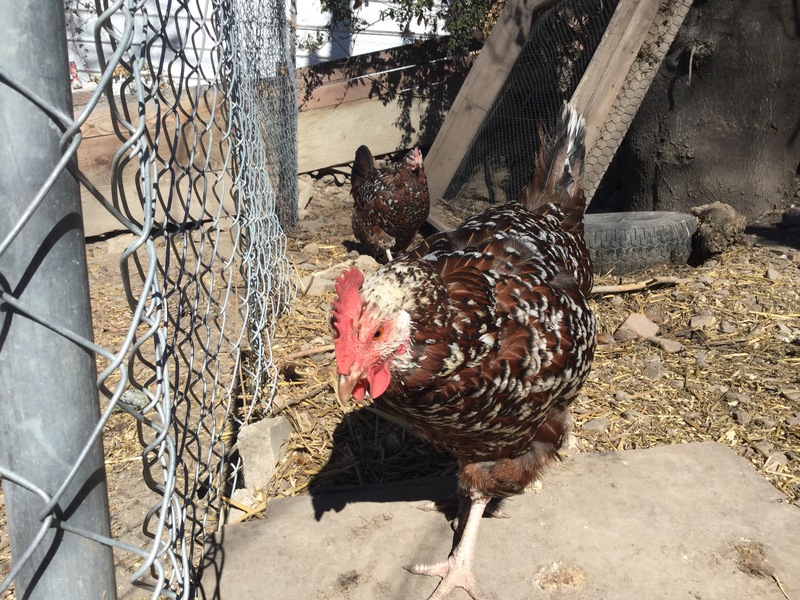 Happy Chickens equals happy eggs in my book! Recently a friend posted that one of her goals in 2015 was to break her paper towel habit. My immediate response was NO WAY but then I got thinking, why do I think this would be impossible. Do I really need that paper towel to clean everything or can it be achieved by a cloth alternative? Can we change our habits and possibly save some money in the process? So I turned to Etsy to look for an alternative and found the store Generation Me which sold a pack of twelve “unpaper” towels for the reasonable $12.00 a pack. I went ahead and took the first step to breaking the consumption habit of paper towels and shortly a package was at our house. Yes, I could have made them myself but this was the easiest way to start. As we are making this transition the next problem arose, where to keep them. I would drape them over the sink faucet only to find them on the counter, not drying. So entered in one of this weekend’s projects finding a better solution to the faucet, our own “unpaper” towel holder/drier. I salvaged all the materials from around the house and used some old spray paint. The project took about 15 minutes of hands on time and already we are enjoying the outcome. Measure out how you want to space the pins, then glue them down wiping away excess glue with a damp cloth or towel. Let dry and turn to another project. When the wood glue is dry or dry enough the pins won’t move, spray paint however you like in an open area. Let dry. Drill sink holes for the screws (optional) and screw into place above the sink or wherever you like in your kitchen. Project complete! While we still have one roll of paper towels around the house for a few emergencies we have taken our first steps to reducing our consumption on the environment and reducing our use of paper products one sheet at a time. Last year we had a heated greenhouse for the winter, extra light, extra everything including a massive power bill for all our efforts. 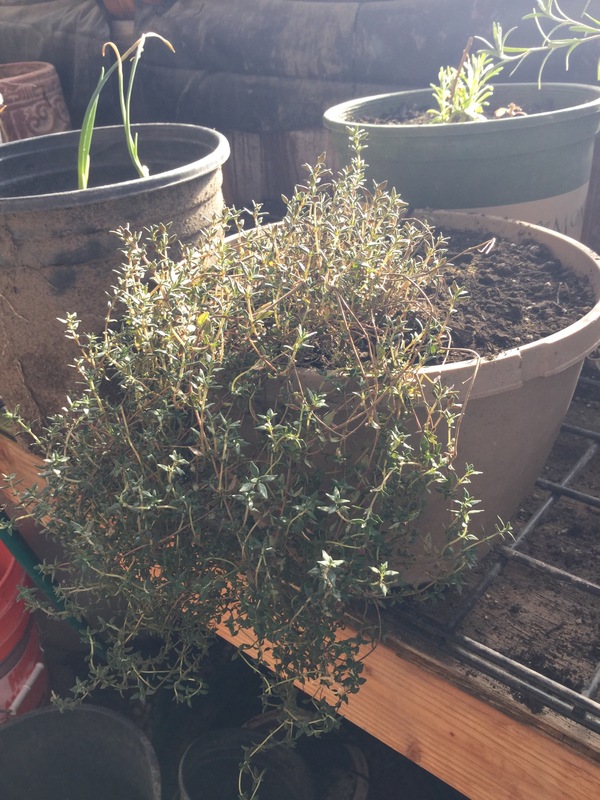 This year we decided to shut the greenhouse down and just leave some herbs out there and let them eventually die off when it got too cold. However, Mother Nature and her infinite sense of humor, decided that Salt Lake City would forego winter all together. Well at least for pretty much all of January and its’s now looking like February as well. 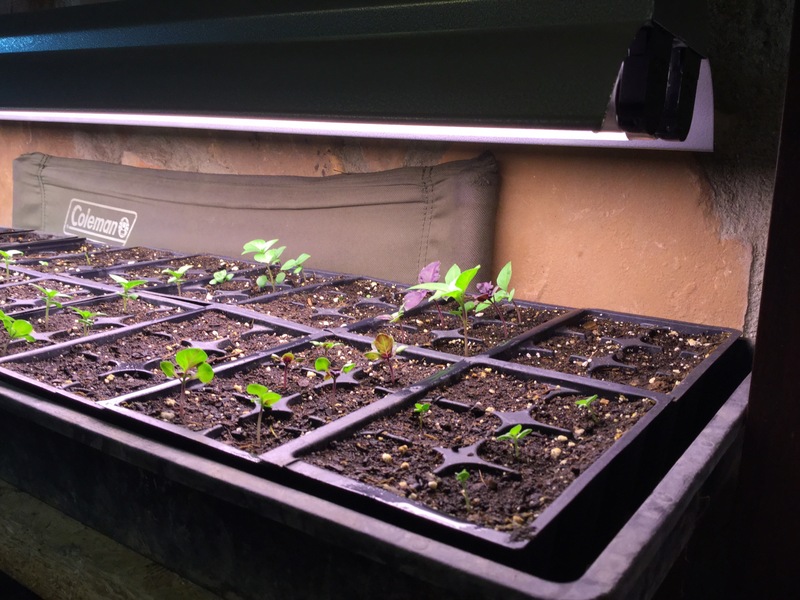 Last year we started our seedlings in a grow chamber in the greenhouse. This year that grow chamber is currently in our kitchen and pumping away. That’s right we caught the bug to start early (maybe too early). It’s hard not to dream when the temperatures are in the high 50’s and low 60’s during the day. Anyways our house has been transformed into a giant seedling growing operation. 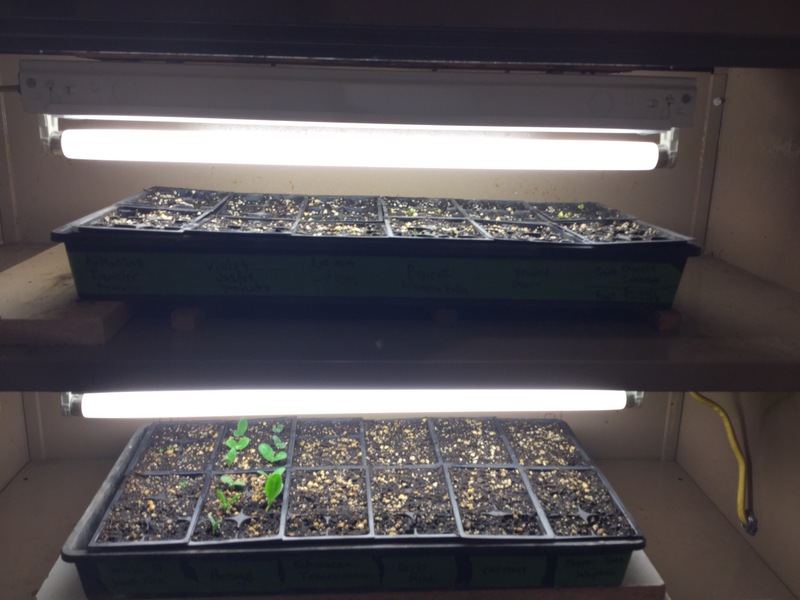 When Forest introduced the idea I was not so psyched about my whole downstairs and part of our bedroom turned into seedlings, but I can say it’s pretty awesome to see them pop up and I find myself taking breaks from writing during the day to check out the seeds. So Forest wins one this time (he wins a lot) I am totally use to half the house dedicated to the early starts of a new growing season. 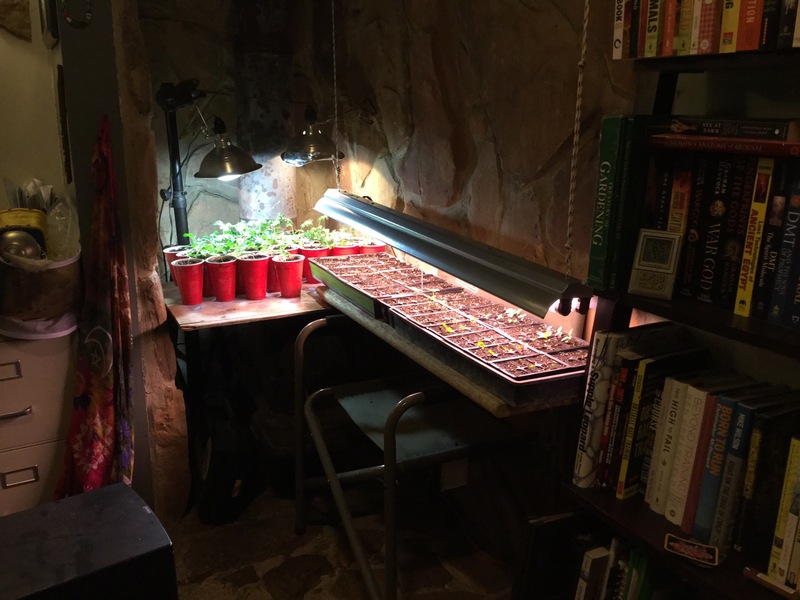 I am dreaming of the lettuce, kale, cabbage, broccoli, basil and more growing in the living room already! What if the Joneses Became Sustainable Urban Farmers? What if one day Mr. Jones decided to trade in his McMansion and Hummer for some muck boots and a straw hat? stainless steel kitchen and fancy jewelry behind to begin raising chickens, rabbits and goats. What if Mr. Jones’ daughter decided to no longer spend her time idolizing rich celebrities and shopping, and instead feel in love with plants, gardens, and nature? And her brother decided to quit watching football and playing video games, so he could help his dad build an Earthship and a passive solar heat system. If people don’t build big houses and buy expensive furniture, how will contractors and supply stores make any money? If teenagers don’t go shopping and play video games, will companies be able to sell there products? Would it force contractors to also become sustainable urban farmers? Would companies have to come up with useful new products that these sustainable people would buy? What if Mr. Jones created a web page that listed all laws and policies with a brief video that gave an unbiased two sided explanation of what was trying to be accomplished, and people could vote yes or no with the click of a button, excluding the need for political representatives, which in turn would end tax payers having to give there hard earned money to them? Would the political representatives have to sell there third homes on Maui? What if Mr. Jones made a documentary that was so thought provoking, that humanity couldn’t help but make all there churches into greenhouses and there golf courses into vegetable gardens, orchards, and farms, to create an over abundance of nutrient rich food for all the worlds people? Would Monsanto lose there strong hold on farmers? What if Mr. Jones devised a plan to spread high levels of education all across the planet, free of charge, to every person willing to learn? Would a well educated humanity stop fighting wars and wasting resources? What if someday, keeping up with the Joneses, actually became a good idea? If I didn’t want aphids to be a part of my life, then I should have been a little more careful. 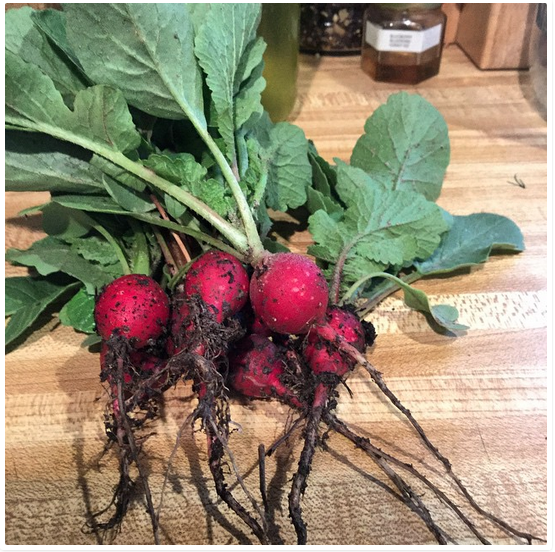 Fall turning into winter and my vegetable garden hadn’t hardly even produced yet, I guess they didn’t have enough sunlight, I’m pretty sure they didn’t have enough nutrients, and I’m almost positive that I planted everything too close together. So my genius idea was to transplant everything into pots and bring them inside the greenhouse to let them finish what they started. What I didn’t plan on were the aphids that I would transport in the process. Aphids love everything about greenhouses, the temperature, the humidity, the plants. From entomologist Stephen A. Marshall: in optimal environmental conditions and lacking any predators, parasites, or disease, a single aphid could produce 600 billion descendants in one season. I tried soapy water, I tried neem oil, I tried lemon juice, I went leaf by leaf smashing them with my fingers, I even politely asked them to leave, and yet they still remain. I wonder if I will lose this battle? I wonder if aphids will overpopulate the earth? I wonder if humans are overpopulating the earth? When are there to many? At what point is there not enough resources to feed them all? When will they kill the very thing that is feeding them? I always find myself preaching that all living things are just as important as the next, and we need to stop the wars and end the suffering. Then squish, another entire family of aphids smashed between my fingers… Are all living things just as important? When the air is polluted, the water is poisoned and the dirt is depleted of nutrients, then what? When everyone has asthma, cancer, and malnutrition then what?